WSU UComm Web Team needs your help and expertise for about 3-5 minutes, please. Attached is a link (see below) to a rough-draft list of schools, departments, programs, offices and units at WSU. The WSU Ucomm team is trying to create a list that is as current and complete as possible, so that these items can be incorporated into WSU’s universal analytics program, which is about to come online shortly. Despite many searches, we know there are a number of items missing, so we are asking you to help us catch those that apply to your area. REQUEST: Please take a few minutes to review this list, to add, delete or edit items that have been overlooked, and/or misnamed. Just insert your corrections, save the document, and email it as an attachment to rfrank@wsu.edu. The MS Word Tracking program has been turned on, so, your edits will appear in color, allowing us to identify and include them. This is a recap of topics covered in our weekly open lab, held every Friday morning from 9:30am-11:30am in ITB2025. We talked about the Overview link automatically created in the Spine navigation when a section label is itself a link to a page. There is a way to change the actual text of “Overview” by setting the title attribute in the WordPress menu management screen. You can also add a generic link to the menu with “#” as the URL. This will create a section label without automatically generating an Overview link. The behavior of this is something that should be better documented on this site. We’ll work on getting something up in the near future. External links in the Spine navigation and general content have Google Analytics campaign data attached to them. Not every URL accepts this parameters nicely. We need to look at whether external links should have campaign data to begin with. This will be tracked under issue #20 on the WSUWP Analytics repository. Links marked to open in a new tab do not always respect that setting, even when using cmd-click to open the link. It appears this is an issue with the scripting we’re using for Google Analytics and it will be fixed in a future release under issue #225 on the WSU Spine repository. It would be great if you could convert one layout to another on the fly in the page builder. At the moment an entire new section must be added and content copy/pasted to the new area. This will be tracked under issue #177 on the Spine Parent Theme repository. The Carson College of Business home page was having some issues when we tried using the new Duplicate and Merge Posts plugin. I’ll be taking a closer look at that to find any bugs. Also, proper styles should applied to category specific calendar pages. There should be a way to exclude labs from the labs.wsu.edu landing page until they are ready. Most of this will take care of itself when we have a better landing page that shows off recent posts from all the labs that are active instead of links to the labs themselves. This will be tracked under issue #2 and issue #3 on the labs.wsu.edu repository. The WSUWP Content Syndicate plugin can pull in posts from other sites using the WordPress JSON API, but not yet with RSS. We should have a shortcode that will pull in an RSS Feed and display it as well. The last modified date seems to be 8 hours off in the list table for posts and pages. This will be tracked under issue #22 on the WSUWP Admin repository. Previewing a page builder page that contains an iframe does not work in Safari. It does work fine in Chrome. This is tracked under issue #154 on the Spine Parent Theme repository. We also talked about text not wrapping properly around left aligned images. We’re working on exploring that a bit in issue #178 on the Spine Parent Theme repository. Beyond bugs… 🙂 I also showed a brief example of the new interface that we’re working on to assign Active Directory editor groups to pages and posts. This work is coming along nicely and a first release will be available soon. One of the most requested features for the WSUWP Platform has been the ability to work on a draft of an existing post over time without saved changes overwriting the original until it was ready. There are several options out there for WordPress that meet various workflow requirements, but it was the Duplicate and Merge Posts plugin that seemed to fit the average workflow the best—and it works. As of today, you’ll see this plugin in your dashboard available for activation. 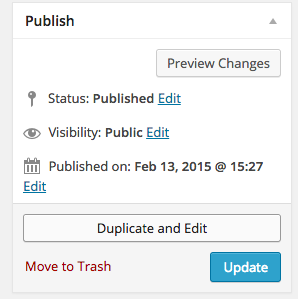 Once activated, any saved posts or pages will have an option to Duplicate and Edit the item. Clicking this button will create a copy of the post or page with “[Duplicated]” in front of the title. A new series of options will then be available in the Publish box for Go to original post, View Side-by-side difference, Merge back to Original Post, and Save as New Post. You can probably imagine what each one of these does, though we’ll have expanded documentation up shortly. Merging back to the original post is key. This overwrites the original post or page with the content of the duplicated item. An entirely new home page can be built out in secret and then merged back in when you are ready to launch. 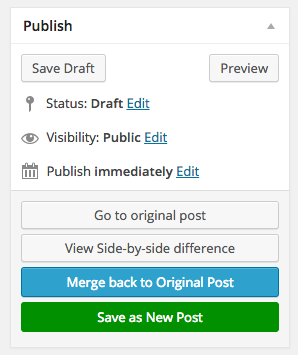 If you go to Settings -> Duplicate & Merge in the dashboard, you’ll see options to restrict the capability for duplicating and merging posts to certain roles. In the future we’ll enable the ability to submit items for review, we just need to figure out the right workflows for that. We’re excited about this plugin as it solves one of the key questions we’ve been asked since starting our effort to bring everyone to WordPress. It is a new addition, so please let us know if you see anything that looks like a bug or if there’s a feature you’d like to see. It’s only been a day, but we’re back with a 0.18.1 release of the Spine Parent Theme. This is a very small release overall. Editor styles have been updated from the upstream theme Make. We’ll be changing these over time to better match the Spine defaults. Right now this improves the image experience quite a bit. The default share text used when sharing by Twitter or by email in the Spine is now dynamically populated with the title of the current page. The via text added to the Tweet will now look for the URL stored in your social options in the Customizer if it has been set. More options for changing these defaults will be added in the future. Version 0.18.0 of the Spine Parent Theme has been released and is now in place on the WSUWP Platform. It contains multiple improvements over 0.17.0. The list below covers some very minor releases for versions 0.17.2 through 0.17.4 as well. Improve the single template for individual people in the University Center Objects plugin. Improve the archive template for a list of people in the University Center Objects plugin. Add missing padding to the footer section on the standard single layout. Add default editor styles for larger images, making them easier to manage. Fix a bug where social icons were not appearing in the Spine by default. Fix a bug where section configuration was not available in page builder for single sections. Add a later priority when enqueueing styles and scripts to cascade on top of plugin styles. Enable Health Sciences Spokane campus signature. Use a campus specific home URL in the Spine. Add actual support for Thumbnail Image on archive views, fall back to Featured Image. Address bug (#145) that caused the removal of <p> tags when updating existing content. As always, please reach out if you have any issues or questions! Issues on GitHub for the Spine Parent Theme can be created by anyone. A general forum for community support will be coming soon.